Each Nintendo hardware has its thing: For the Wii, it's motion controls; for the 3DS, it's 3D; and for the Wii U, it's a tablet-like controller. Dubbed the Wii U GamePad, that controller was almost killed off. "Sometime during that final discussion we almost gave up on the idea of the additional screen," Iwata recently told The Telegraph. "This was due to our concern over the expected high cost, it may not have been feasible to create this and sell it at a reasonable price point for the consumers." 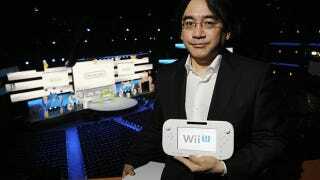 Iwata is likely referring the the final discussion before deciding that this console would have a tablet controller. Regardless, Nintendo figured out how to get the screen in the GamePad and still offer the Wii U a reasonable, yet undisclosed, price. And, thus, the Wii U GamePad has a screen. Last year, there was concern online in Japan about the Wii U GamePad's screen quality, with some pointing out that it looked "yellow". The Wii U GamePad in the above image doesn't look yellow, so perhaps Nintendo figured out how to get the screen in the controller for a reasonable price and not sacrifice image quality.